DUMBARTON produced Scottish football's result of the day when they upset Irn-Bru Scottish League division one leaders Morton 3-0 at Greenock's Cappielow Park. New manager Ian Murray gained a second victory in his second league match in charge, and his side did him proud as they got off to a flying start in 2013. They are still in bottom place in the division, but narrowed the gap on Airdrie United to three points. On a grey, windy and wet afternoon in front of a crowd of over 2,000 both sides tried to attack and it made for an entertaining match throughout. Chances were missed at both ends before Garry Fleming slammed home the opening goal, and seven minutes later Scott Agnew also netted from distance. At the other end keeper Jamie Ewings pulled off some splendid saves, and in the second half he repeated the performance as Morton tried to reduce the deficit. However the goal came at the other end. Steve McDougall broke into the penalty box and crossed, and there was sub Bryan Prunty to slam home no.3 with only a few minutes remaining. There was no way back for the shocked league leaders. 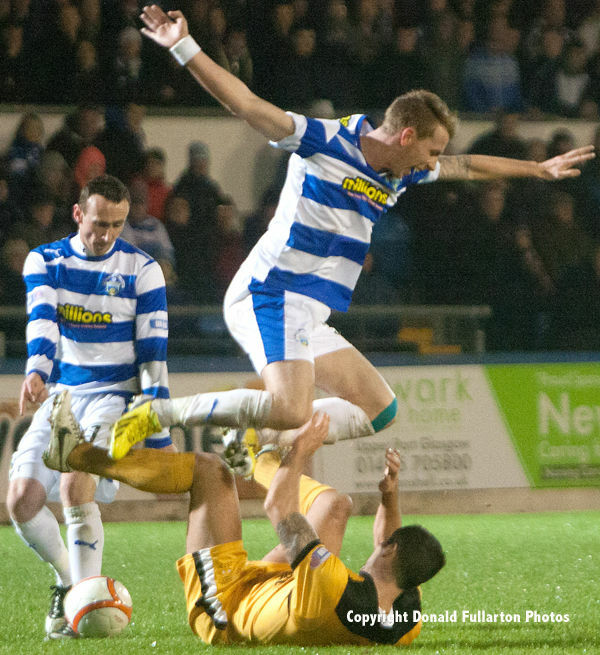 The photo shows midfielder Chris Turner who was injured in this clash.